HEC Paris graduates pose for a group photo. 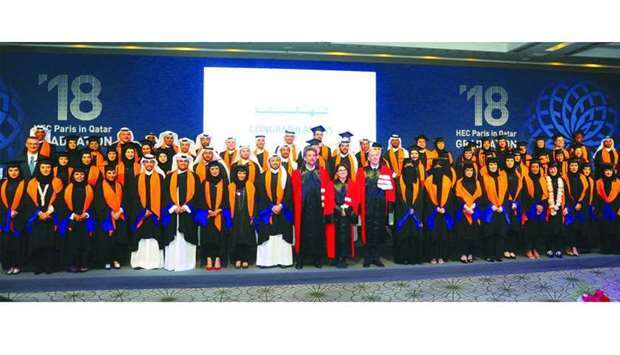 HEC Paris, one of the world’s leading providers of executive education, has honoured the Executive MBA (EMBA) and Specialised Master in Strategic Business Unit Management (SBUM) graduating classes of 2018 during a ceremony held at the St Regis Hotel. Dr Ibrahim al-Naimi, undersecretary of the Ministry of Education and Higher Education; Franck Gellet, ambassador of France; Laurent Wolffsheim, managing director at Total Qatar, Abdulrahman Alsuwaidi, chief executive officer of Qafco; Abdulla Mubarak al-Khalifa, acting group CEO at QNB; Sheikh Jassim al-Thani, chief human capital officer at CBQ graced the graduation ceremony. Prof Eloic Peyrache, dean of programmes at HEC Paris, Prof Nathalie Lugagne, associate dean of Executive Education at HEC Paris and Dr Nils Plambeck, dean and CEO of HEC Paris in Qatar, attended the event. Hisham Nourin, executive director, Strategy, Administration & Projects at Qatar Foundation and HEC Paris alumnus (EMBA, Class of 2016) emceed the ceremony. This year’s graduating class included 28 Executive MBA (EMBA) and 77 Specialised Master in Strategic Business Unit Management (SBUM) participants. While more than half of the EMBA graduates are Qataris, 10 different nationalities were present in the class: Australian, British, French, Indian, Jordanian, Kuwaiti, Lebanese, Mexican, Omani and Swedish. Around a quarter of the EMBA graduates are women. The Class of 2018 has also seen a higher ratio of female intake to male in both SBUM cohorts. About two-thirds of the SBUM graduates are female. HEC Paris in Qatar is particularly proud of this and the contribution it is thereby making. This year’s SBUM honoured graduates also included Egyptian, French, Indian, Lebanese and Yemeni nationals. Dr Plambeck, said, “It is indeed a proud moment for us to see our graduates showcasing academic excellence and being ready to take the next leap forward by applying that knowledge into practice. They are now better equipped to further advance their successful careers, whether as senior figures within their organisations, or as entrepreneurs taking advantage of expanding business opportunities, and helping to further diversify Qatar’s economy”. “The journey of HEC Paris in Qatar has been remarkable. We express our gratitude towards the graduates for the trust they have put in us to embark on this executive education journey and commend each one of them for their hard work. Qatar has inked a special place among all the HEC Paris locations across the globe. We once again congratulate the graduates and wish them the best for their future endeavours,” noted Peyrache. “I am very proud to see that HEC Paris is a success story here in Qatar. This graduation ceremony is an additional proof of this achievement. Indeed, with this Class of 2018, the total number of graduates of HEC Paris in Qatar since its inception will exceed 500, to reach 586 students. The experience of HEC Paris is a remarkable example of how France and Qatar can reach excellence in their co-operation in the field of higher education”, said Gellet. In addition to the graduation ceremony, the event included an awards ceremony honouring EMBA and SBUM participants for their work. The award for the Best Capstone Project for the EMBA Class of 2018 went to Noof Ahmed al-Thani and Abeer al-Khalifa. The award for the Best Thesis for the Specialised Master 2018 Cohort 1 was received by Nisreen al-Malek. Best Thesis for the Specialised Master 2018 Cohort 2 was awarded to Tamader Eid al-Muhannadi.